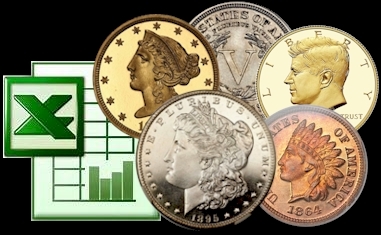 NumisMedia Price Guides (Market, FMV, PCGS, NGC, CAC & Plus + prices) in Excel database format (.xls), are updated monthly (around the first of the month) or weekly (Monday) via email as described in the database license. Databases and the information within shall not be used or distributed in any way that is not intended in the usage license. By completing the usage agreement and purchasing a database license you agree to our Disclaimer of Warranty and Limitation of Liability and the following NumisMedia copyright and website use terms below. You may cancel anytime by contacting us at numismedia@yahoo.com or by logging in to your PayPal account (a PayPal account is not required). After completing the purchase agreement and selecting a license payment option, you will receive the selected database(s) via email within one working day. The information provided on this site or by NumisMedia or in any communication containing a link to this site is not intended for distribution to, or use by, any person or entity in any jurisdiction or country where such distribution or use would be contrary to law or regulation or which would subject NumisMedia or its affiliates to any registration requirement within such jurisdiction or country. Neither the information, nor any opinion contained in this site constitutes a solicitation or offer by NumisMedia or its affiliates to buy or sell any securities, futures, options or other financial instruments or provide any investment advice or service. The information provided by NumisMedia, on the NumisMedia websites, or on any site that it links to, is provided "AS IS". NumisMedia does not warrant the accuracy of the materials provided herein, either expressly or impliedly, for any particular purpose and expressly disclaims any warranties of merchantability or fitness for a particular purpose. NumisMedia will not be responsible for any loss or damage that could result from interception by third parties of any information made available to you via NumisMedia. Although the information provided to you on this site is obtained or compiled from sources we believe to be reliable, NumisMedia cannot and does not guarantee the accuracy, validity, timeliness or completeness of any information or data made available to you for any particular purpose. Neither NumisMedia, nor any of its affiliates, directors, officers or employees, nor any third party vendor will be liable or have any responsibility of any kind for any loss or damage that you incur in the event of any failure or interruption of this site, or resulting from the act or omission of any other party involved in making this site or the data contained therein available to you, or from any other cause relating to your access to, inability to access, or use of the site or these materials, whether or not the circumstances giving rise to such cause may have been within the control of NumisMedia or of any vendor providing software or services support. In no event will NumisMedia, its affiliates or any such parties be liable to you for any direct, special, indirect, consequential, incidental damages or any other damages of any kind even if NumisMedia or any other party have been advised of the possibility thereof. By utilizing this site or info provided by NumisMedia, you agree that the maximum amount of damages that NumisMedia shall be liable for, under any circumstances, including Gross Negligence, shall be the amount of the subscription paid, if any. By downloading any of our databases or any information or software from this site, you agree that you will not copy it or remove or obscure any copyright or other notices or legends contained in any such information. NumisMedia, its subsidiaries and affiliated companies ("NumisMedia") respects the intellectual property of others and asks that our users and those posting or linking content to this site do the same. It is the policy of NumisMedia to respond expeditiously to claims of intellectual property infringement by promptly processing and investigating notices of alleged infringement and taking appropriate actions under the Digital Millennium Copyright Act ("DCMA") and other applicable intellectual property laws. If you believe that your copyrighted work is accessible on this site in a way that constitutes copyright infringement, you may notify us by providing us with the following information: 1) the electronic or physical signature of the owner of the copyright or of the person authorized to act on the owner's behalf; 2) identification of the copyrighted work or other intellectual property that you claim is being infringed; 3) identification of the material that you claim is infringing; 4) identification of the URL or other specific location on this site where the material that you claim is infringing is located (please be as specific as possible); 5) your name, address, telephone number, and email address; 6) a statement by you that you have a good faith belief that the disputed use is not authorized by the copyright owner, its agent, or the law; and 7) a statement by you, made under penalty of perjury, that the information in your notice is accurate and that you are the copyright owner or are authorized to act on the copyright owner's behalf. Should the viewer leave this site via a link contained herein, and view content that is not provided by NumisMedia, the viewer does so at its own risk. The content to which you link will not have been developed, checked for accuracy, or otherwise reviewed by NumisMedia. NumisMedia is not responsible for damages or losses caused by any delays, defects or omissions that may exist in the services, information or other content provided in such site, whether actual, alleged, consequential or punitive. NumisMedia makes no guarantees or representations as to, and shall have no liability for, any electronic content delivered by any third party, including, without limitation, the accuracy, subject matter, quality or timeliness of any electronic content.